Now you see it; now you don’t. 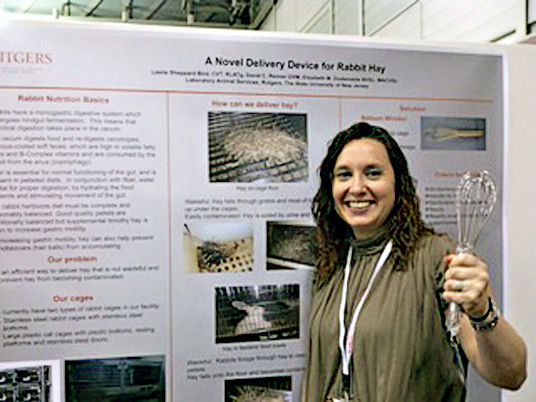 If you did not attend the recent Tri-Branch Symposium in Atlantic City, NJ, you will not have seen a terrific poster on a novel delivery device for rabbit hay. This poster created quite a stir, and we hope it will eventually find a home in our new Poster Repository. Shown is Leslie Sheppard Bird. The Enrichment Record, together with the Veterinary Bioscience Institute, is excited to introduce The Enrichment Record Poster Repository. This open access poster repository will provide a structured and safe environment for the deposition of enrichment posters. Often, enrichment information presented as posters at conferences is not published and is lost once a conference is over. If it is published, it is published at a much later date. 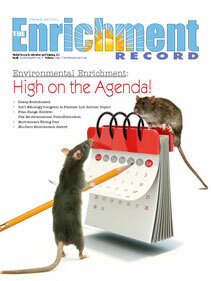 This repository will provide Laboratory Animal Science community members with access to early enrichment information presented at conferences while allowing authors to maximize the value of their posters by dramatically increasing availability and by helping to prevent lengthy delays before others can benefit from their new enrichment research. The Enrichment Record Poster Repository is subdivided into categories by species, making it easy to locate information for the viewer. The submission process is simple and has safeguards in place to ensure applicability and maintain quality standards. After a poster is submitted, there is a 24-hour delay, which allows time for review of submitted information to confirm that it is appropriate for the site. The Enrichment Record Poster Repository is an open access repository, meaning that anyone will be able to view these posters. We believe open access promotes transparency and supports outreach efforts that help educate both internal and external audiences. Sharing is the optimal way to distribute information to the Laboratory Animal Science community and beyond. There is the ability to post posters anonymously as long as you provide your authorship information to The Enrichment Record. We are looking forward to your submissions and feedback.